Last week was exhausting. Every day there were more activities to celebrate Teen Read Week. These 6th graders are visiting the library at lunch to play Believe It or Not. Every winner got a sweet treat. Two seniors dressed as characters from two sci fi movies to participate in photo ops with the middle schoolers. One of the most successful activities was the ALIEN -ate Yourself Wall. 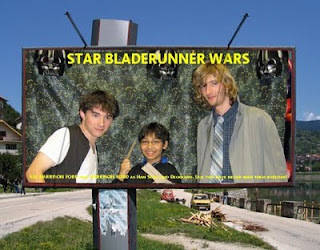 We took digital photos of the students, and they manipulated the images at picnik.com to create an alien version of themselves. 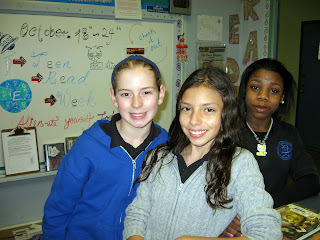 See more of these here-->http://pftstalibrary.weebly.com/teen-read-week-2009.html.